Some of us don’t like change–note the “us.” Even accepting small changes can be a challenge. There’s an unnerving sense that something isn’t right. 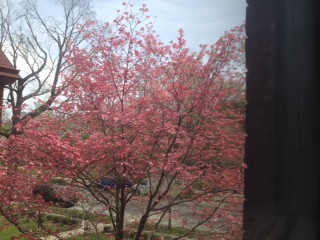 A subtle disequilibrium persists while you wait for an outcome, even if the answer doesn’t really matter at all in the great scheme of things–like whether my dogwood that has always been pink will forever after be subtly red like it is this year. The Holy Spirit is designated in the New Testament as the paraclete, the One who helps–the Helper Who comes alongside and counsels as we go. G. Campbell Morgan loved to quote one phrase from Deuteronomy 33:17 in sermons: “…underneath are the everlasting arms.” Sometimes when things are changing around us and we don’t know how they’re going to turn out, and we think we’re not going anywhere, just waiting, that’s okay, too. God’s all-powerful arms are there for support, His Spirit has come along side, whether the change is big or small, or the result is temporary or permanent. I suspect that thinking about the significance (or lack thereof) of the small changes helps us accept them, and more importantly, be less panicked and more willing to wait and see what in the world God is going to do next, when the big changes come. Are you expecting a change in your life soon? My desk in the new upstairs office I’m slowly creating is the mahogany dining room table I knew as a child. When I sat at it then, it was in the center of the room, and my focus was on what was on it. When I sit at it now, I’m at eye level with the branches of a massive dogwood tree outside the window and my attention is often drawn to what I can see outside. Today there is a squirrel in that dogwood tree whose “dining room table” has almost certainly been my yard for generations of his family. And now we’ve made eye contact and surprised each other, me looking out, him looking in. I think my old mahogany table/desk is to me what that dogwood tree is to him. Both vantage places offer the security of the familiar, and allow us to feel emboldened to pause and study things we’ll never get to physically explore because they’re too foreign, too dangerous, too far away in distance or time, or simply incomprehensible to us. 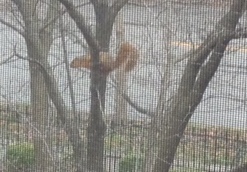 The squirrel has no understanding of my desk, and never will, and I can’t climb to the top of a tree, and never will; but unlike him, my ultimate exploration will be a “forever” instead of a “never.” The Bible says,”Eye has not seen, nor ear heard, neither has it entered into the heart of man, the things that God has prepared for him.” Someday, the secure support of the old and familiar won’t be needed anymore, and as much as I enjoy it now, I won’t mind at all! This entry was posted in Blog on May 15, 2016 by lrmayfield. CONTEXT: What’s YOUR Biggest Hat? 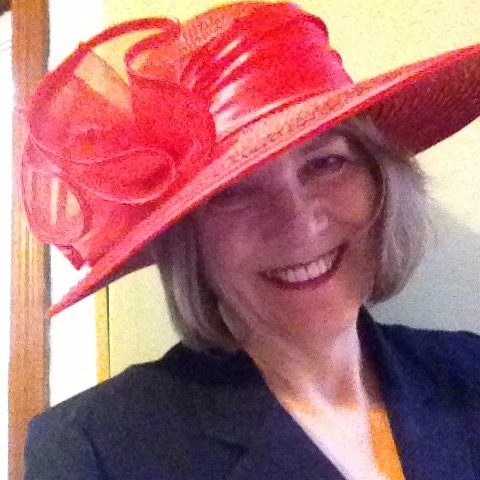 So do I have a writer’s hat or an author’s hat? Does it depend on what I’m writing, or if it gets published or not? I don’t know, and I don’t know if it matters. I just need to make sure I show up with the right hat at the right place. At 11:27 last night, I sent off a 99,968-word manuscript of a novel I wrote, to be considered by a publisher. At that moment, I felt very much I should go out and get a hot fudge sundae and wear my author’s hat. But today is Mother’s Day, and I’m happily calling myself a mom. Get out the biggest hat! What are you doing when you “wear your biggest hat”?